I didn't expect, when I went down to Hill Country Middle School to perform this morning, that nearly all the kids and a bunch of adults would be set up in elaborate Renaissance costumes. On the way over there I started to worry, because the impression I'd gotten was that I'd be on a stage in the cafeteria, while the kids were eating, and I thought I was going to be up there alone for a full hour, and that it would be hard to interact with the kids since they'd be eating. But because it WAS a chaotic cafeteria environment, I instead wandered from table to table, got right in the kids faces, and did my bit. It was a lot of fun. They even had baskets of french bread on the tables, so I was able to break and juggle the bread, a favorite Madrigal Dinner trick of mine. I had unpacked my renaissance costume for the University of Texas Madrigal Dinner, and was just glorying in the fact that I can still fit into my tights (maybe it's not a feat to fit into spandex, but humor me...). Madrigal was a ton of fun, especially since last year was the first year I've skipped it in many, many, many, many, too many years -- years which reveal how very long it has been since I was in college. But here I was, looking at my bright green costume which has lasted for so many years (since it only gets used for one week out of the year)...and then a post on the Texas Juggling Society mailing list asked for a juggler to do a middle school renaissance fest. 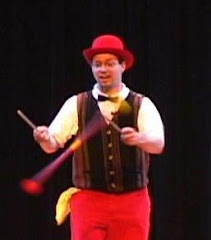 So that's my Friday thing this week, juggling for some middle school kids while wearing tights. Should be fun.